Is A Big, Blue Wave Forming Off The Political Coast? After Democrats pulled off wins in 2017 that were bigger than expected, Republicans and Democrats are wondering what that means for the 2018 midterms. Democrat Ralph Northam celebrates his election as governor of Virginia on Nov. 7. Members of both parties are wondering what that race and other recent success for Democrats will mean for the 2018 midterms. 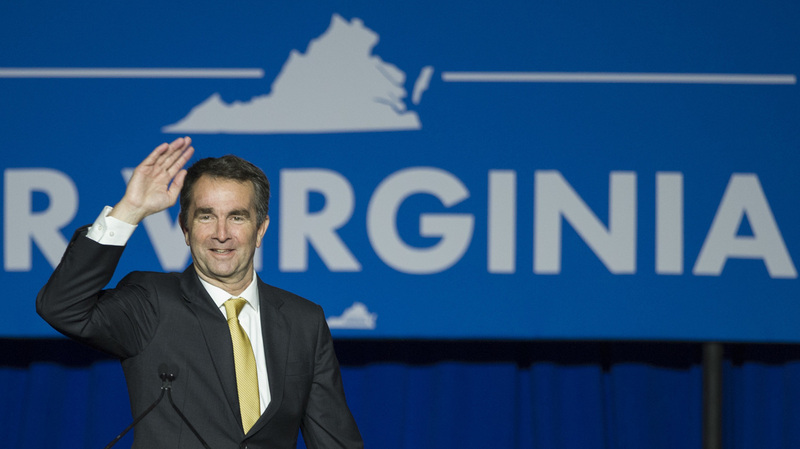 Democrats were girding for a narrow loss in Virginia's gubernatorial election and had already begun to assemble their favorite formation — the circular firing squad. But that wasn't necessary. The Democratic base was energized. The 2008 Obama coalition of millennials, minorities, single women and affluent educated suburbanites showed up at the polls, something that hadn't happened in 2010 or 2014. Democrats have been battling a kind of off-year election curse — they get their voters out in presidential years, but can't convince them to turn out for off-year or midterm elections. Virginia may have finally broken the spell. 2. But, but, but ... can the lessons of Virginia work in states like Missouri and Indiana? If the Democrats' goal is to take back the House and limit their losses in the Senate, they have to figure out how to replicate their Virginia win in places that don't have the same number of affluent, well-educated suburbs. Virginia is a special place. In addition to that suburban population, it has thousands of federal workers who are focused on Donald Trump's presidency and what's happening in Washington, D.C., in a way that voters elsewhere just aren't. And there were limits to the Democratic victory in Virginia. They got their own coalition out, but they didn't make inroads with the Trump vote. White, working-class voters outside of the big cities and suburbs voted strongly for Republican Ed Gillespie, indicating that the Trump vote in Virginia was stable from 2016 to 2017. For Democrats to win a majority in the House and to hang on to Senate seats in red states like Missouri, Indiana and West Virginia, they need to reach out to those voters in an effective way. In many states next year, Trump will not be the radioactive factor he may have been in Virginia this year. Democrats know they still need an economic message — something Hillary Clinton never communicated in 2016. Health care is a big part of this. It was voters' top concern in Virginia. Democrats are also hopeful they'll be able to run against the Republicans' tax bill, which is seen by large numbers of voters as favoring the wealthy more than the middle class. Off-year elections are traditionally tough for the party in power. Republicans now control all branches of government. Historically, when a president's approval rating drops below 50 percent, his party loses an average of 40 seats. So Republican operatives are telling their clients who represent suburban seats and those in districts that Hillary Clinton won in 2016 to get ready, raise a lot money, and pay attention to their constituents. Republicans have some structural advantages this cycle. Because they controlled the redistricting process in the majority of states after the 2010 census, most Republican members of the House are in safe seats. In addition to gerrymandering, Democratic voters are clustered inefficiently in urban areas. That means that Democrats have to win way more than 50 percent of the national vote for the House of Representatives in order to get 50 percent of the seats. The mighty fortress of redistricting helps, but it may not be enough to hold off a giant blue wave, if that's what ends up crashing on shore. 5. The solution for Republicans is – GOVERN! Republicans say their main task is to show that they can govern. They need to pass the tax bill and make sure the government doesn't shut down. They have some control over that. What they can't control is the president and his Twitter feed — both of which loom over the 2018 campaign. Midterm elections are always a referendum on the party in power, and they are often a reaction against the president. That's what happened to Barack Obama and the Democrats in 2010 and 2014. President Trump has yet to show how he helps Republicans when he's not on the ballot.